Our fabrication and sheet metal activities include in-house CNC waterjet cutting, sheet metal folding and various certified welding procedures. We also work very closely with many of our partners to offer hard anodising, powder coating, laser cutting as part of an end product. Over the years we have designed and manufactured many bespoke items from the Widdops’ Heavy Duty Forklift Sweeper Attachment to our ‘Lampcracker’ disposal units & most recently the My Key Machine for automated key cutting in supermarket across the country. We have CNC folding and bending capacity handling sheet size of up to 3000mm x 1200mm x 6mm mild steel and 3mm stainless steel. 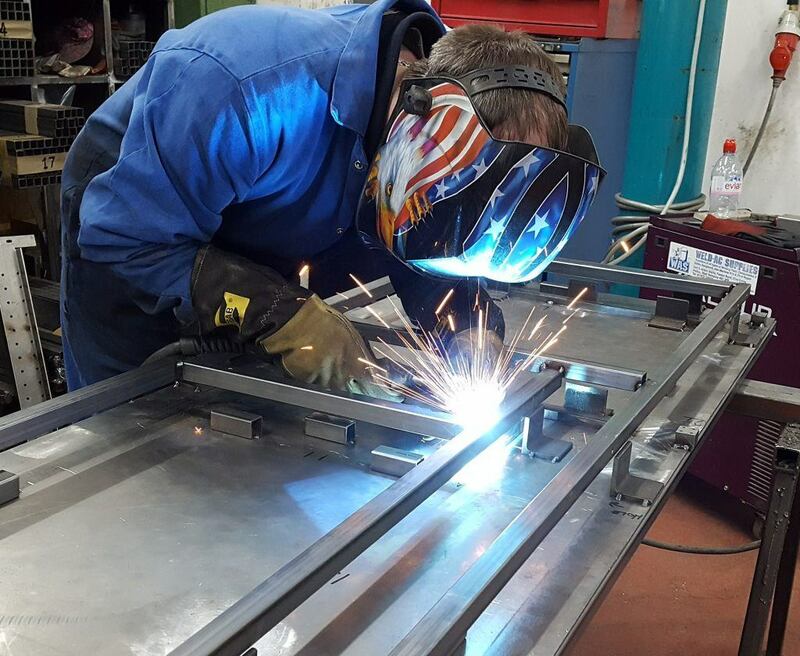 Our welding covers materials such as stainless steel, mild steel and aluminium with the types of work we undertake ranging from machine frames to fluid and solids chutes, brackets and guarding. Along with our fabrication and sheet metal working facilities, we offer subcontract CNC waterjet cutting which allows us to cut a broad range of materials to high tolerances of precision. Waterjet cutting is a process that regardless of quantity requirements, can rapidly produce complex, intricate shapes to a consistently high quality standard without the need for further machining of the cut edges or any of the other inherent material changes issues often related with laser cutting. Producing a 0.8 mm jet of water and garnet cutting abrasive powder at approximately 60,000 PSI, the waterjet machine allows us to cut intricate shapes to tolerances of +/- 0.2mm—removing just 1mm of material. Individual items may be cut to approximately 3m x 1.5m and to a depth of 200 mm. A wide variety of materials can be cut by waterjet, including steel, stainless steel, granite, wood, aluminium, plastic, Perspex, foam, carbon fibre, Kevlar and composite materials.